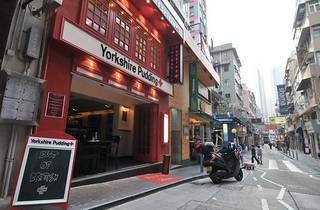 Soho isn’t exactly short of spots that serve up British-style pub food, but something about Yorkshire Pudding piqued our interest. Perhaps it was the pillar-box red fronting and the words “Best of British” emblazoned on an exterior that formerly housed La Fauchon. Then again, it could have been the menu offering enough hearty comfort-food stodge to make any subject of Her Britannic Majesty weep patriotic tears of thanks. Whatever the reason, the positive signs continued when we arrived to check it out. The ground-floor bar offered a couple of ales on tap, and a few more bottled in the fridge (unfortunately they were still waiting on their liquor license when we visited, so drinks were ferried from nearby Staunton’s). Upstairs, in the homely restaurant space (which has a pull-down big screen for post-dinner footy-watching), Yorkshire Pudding scored points straight off for having a bottle of HP sauce on every table – although points were lost for having Del Monte ketchup instead of the necessary Heinz. Given the belly-busting main courses on offer – including such favourites as toad in the hole, bangers and mash, fish and chips, plus a variety of pies and stews – we’re guessing most diners here will forego the starters, but that would be a shame. The leek and potato soup ($55) was excellent, tangy chunks of stilton enlivening the broth’s creamy goodness, while the salmon and prawn cake ($88) was surprisingly light and non-greasy. Then again, it’s all about the main event here, and we wasted little time in plumping for two Sunday afternoon essentials: steak and kidney pie ($148) and roast beef ($160). The pie came in a bowl with a pastry top (we’d have preferred a complete pastry casing) but we couldn’t argue with the filling: juicy chunks of beef in gravy, with three whole kidneys. It also came with a choice of two sides from a list of seven – we went for the proper English-style chunky chips and the mushrooms in red wine. The roast beef was nicely cooked at the medium-rare we’d requested but was a little tougher than we’d have liked. 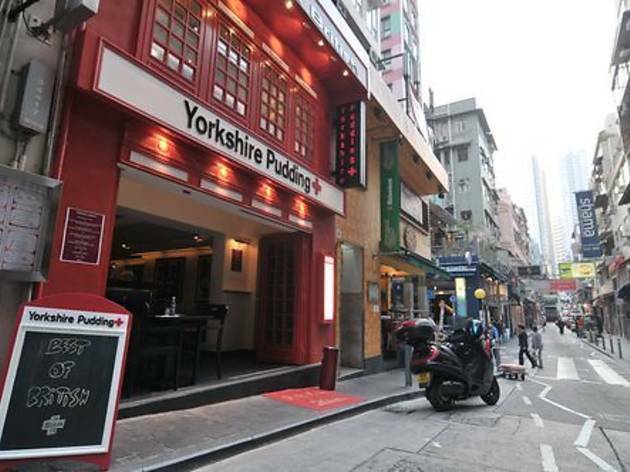 The sides, however, were impeccable: the seasonal vegetables were bursting with flavour, the roasted potatoes had the perfect combination of slightly crisp outside/firm but yielding inside, and the pair of puddings that lend their name to the place came half-filled with rich gravy. Ask for the gravy on the side if you like them a little less soggy. We considered giving our bulging bellies a rest and skipping dessert, but in the end we were glad we soldiered on – the sticky toffee pudding with toffee sauce and clotted cream ($68) recommended by our waitress was a winner. It might not be the kind of food we recommend you eat every day – or even every week – but with its Brit-nostalgic menu, large portions, quality ingredients and friendly service, Yorkshire Pudding is a safe bet when the desire strikes. Or, as they say in Yorkshire: It were reet champion. 6 Staunton St, Soho, 2536 9968. Daily 10am-midnight. Meal for two: around $500.